It's kind of hard to believe that it's September! It seems like the whole summer just flew by in no time at all! 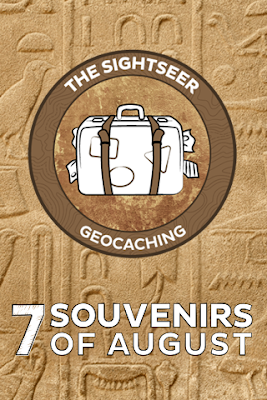 During August, my family and I participated in the 7 Souvenirs of August, a geocaching challenge to earn 7 souvenirs during the month of August. 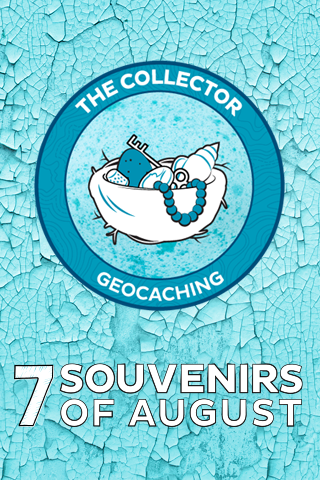 Each of 6 souvenirs required us to find certain types of geocaches and, once we acquired all six souvenirs, we got to acquire the 7th souvenir for our achievement. 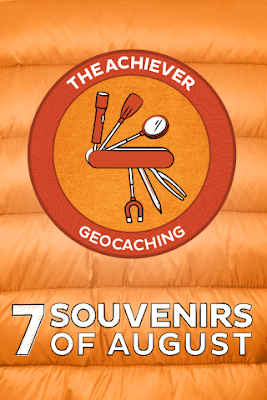 As you can see above, the 7th souvenir is appropriately named the Achiever souvenir. 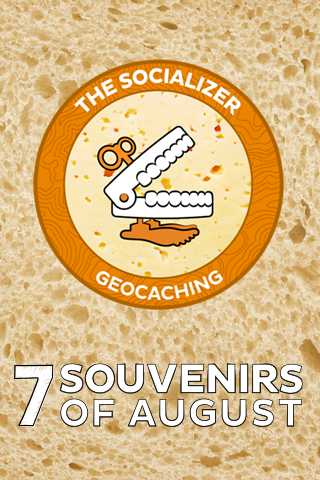 The first souvenir that we acquired was the Socializer souvenir on August 16th. This souvenir required us to attend a geocaching event. We attended a small meet and greet event hosted by an awesome local cacher. She has hidden some neat caches and she is so nice! It was at a Tim Horton's at 8AM and there were only 3 other geocaching users (of course my family is a small group under one username so there were more than just 3 people) in attendance besides herself. It was nice though just to have a small group to chat with over breakfast. 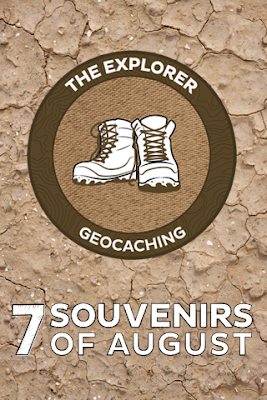 The second souvenir that we acquired was the Explorer souvenir after the meet and greet event on August 16th. This souvenir required us to find a traditional cache. The geocacher who hosted the event gave us lots of help for a tricky geocache that we had been having trouble finding and that she had already found. We found it right where she said it would be and right where it said it would be on the cache page; right in front of our eyes. It was a nano cache that blended in very well with its surroundings. The third souvenir that we acquired was the Collector souvenir on August 22nd. This souvenir required us to find either a virtual cache, wherigo, letterbox hybrid, or webcam cache. We ended up completing a virtual cache on a trip to another city where my brother visited a fried for the day. We had to go to a historical location and find some information which we then had to email to the owner of the geocache. We had tried to complete this virtual cache once before but were not able to find the information the first time. This time, we were successful. The fourth souvenir that we acquired was the Puzzler souvenir on August 25th. This souvenir required us to find a mystery cache. We solved and found a mystery cache hidden by the same geocacher who hosted the meet and greet event that we attended. We had to visit a grocery store and use clues to figure out the coordinates which led us to the micro geocache not too far away. Although, our handheld GPS goes weird when we manually put in coordinates so we had to use both our handheld GPS and our car GPS to find the geocache. They led us around like crazy and we ended up getting to the geocache by means of a more difficult way than was intended. We were happy to have at least found the geocache and acquire our souvenir. 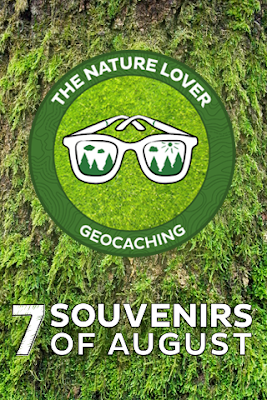 The fifth souvenir that we acquired was the Nature Lover souvenir on August 26th. This souvenir required us to either complete an earthcache or attend a CITO event. We ended up completing the only earthcache in our city. It was all about different types of rocks so we had to take a photo of a rock and identify it using examples and plaques in the area. It was fun and the area was beautiful! The sixth souvenir that we acquired was the Sightseer souvenir on August 27th. This souvenir required us to find a multi-cache. 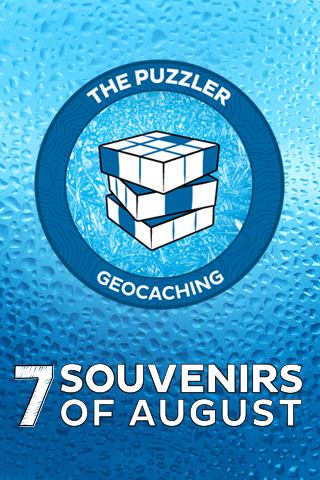 We found a very basic multi-cache for this souvenir because there are not a whole lot of multi-caches in our city and most of them take a while when all we wanted was to finish the challenge and get our Achiever souvenir as soon as possible. The multi-cache that we found gave us coordinates at which we found the coordinates to the next spot where we, once again, found coordinates which finally led us to the final cache. In acquiring this final souvenir, we were able to acquire the Achiever souvenir and complete the 7 Souvenirs of August challenge! We locked in as the 47,265th geocaching username to earn the Achiever souvenir which is pretty good because there are actually millions of geocachers! It was so much fun!